I’m so excited to share this peach ale breakfast loaf with you! It is moist, fragrant and just sweet enough to welcome the most generous dollops of honey butter you’d allow yourself. In my case, they tend to be very generous. Totally an original Perrine craft beering recipe by the way. The beer for breakfast kind. 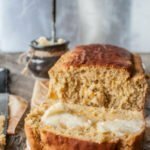 I made it twice last week – once to translate my thoughts into a tangible thing and the second time to make a video and double test the recipe for what turned out to be a delicious loaf. Both times I could hardly wait for it to cool down so I could cut a slice, smother it with honey butter and dig in. Even our die hard banana bread fan, newly minted second grader took to it with formidable enthusiasm. Maybe because I loosely based my recipe for this peach ale breakfast loaf on the banana bread I make literally every week for him. This loaf has no less than four fresh peaches in it, peeled and diced, but of course, the star of the show is the delicious peach ale. Long time favorite actually. Before Chris ever brewed us peach saison, we were buying this one like crazy. It is called Perzik Saison and it is a seasonal brew of Avery Brewing Co. in nearby Boulder, Colorado. The Perzik is essentially a classic saison, without notable bitterness, instead a beautiful spicy backbone, dry and crisp in result of the the unrelenting Belgian Saison yeast. The Bravo hops used to flavor the ale are known for contributing vanilla, orange, earthy and floral aromas which in combination with the peaches added during the secondary fermentation create the most tempting fragrant fruitiness imaginable. Really a delicious brew for summer. ABV is 6.4%. The peach ale made the bread nice and airy, the perfect textural backdrop for the juicy peach bits. Also, because the saison is so fragrant, I didn’t use any vanilla. OK, maybe I am a little bit proud of myself for making this loaf. Or more like serendipitously and gratefully excited, if you can imagine what that feels like. About the peaches – I was surprised to find out that there could be such a difference between seemingly comparable varieties grown in different states. You live and you learn. The first time I made the loaf (pictures) I used California grown peaches. Wish I could remember the exact variety. The second time I made it (video) I used Colorado Palisade peaches of the Red Globe variety. In both instances the peaches were ripe and sweet, but with good firmness to them. I peeled and diced them just the same, yet the California peach bits partially dissolved into the batter during baking, while the Colorado variety bits retained their shape. Wish I could tell you why. I will update the post if I find out, in the meantime if you know why, please let me know in the comments. Thank goodness I don’t write a blog for an orchard! I am so much more comfortable discussing craft beer. 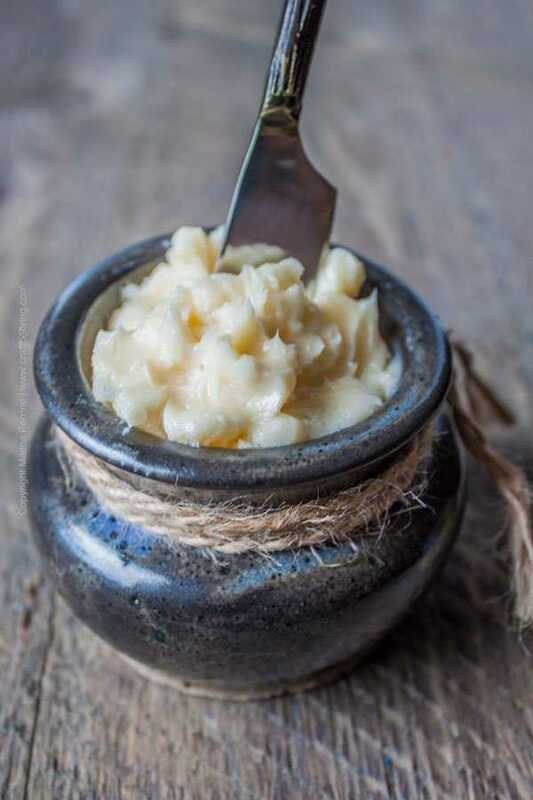 The honey butter is something I grew up eating. My grandma would whip a bowl of it every week and spread it over freshly baked bread for us kids to have as afternoon snack. I loved it on morning toast too. 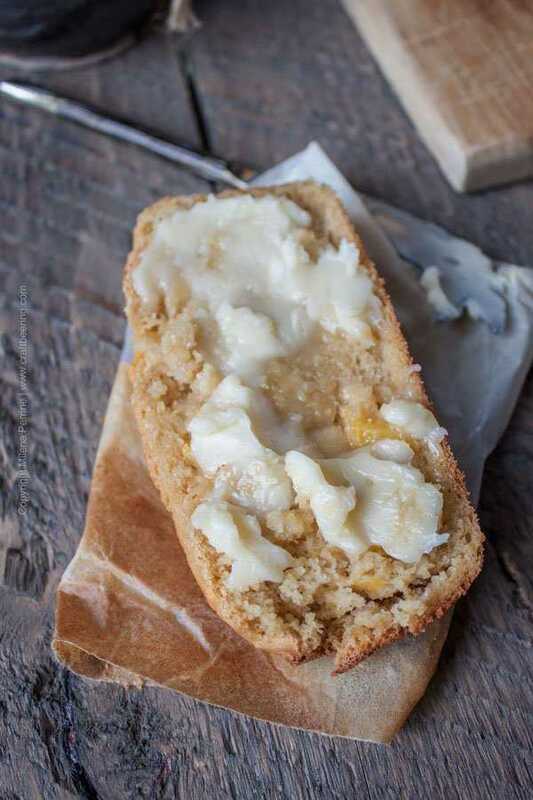 To me there is something extremely comforting in the rich sweetness of honey butter and spreading it over the peach ale breakfast loaf added a sense of familiarity and warmth. Time for the video – see how easy it is to make this beauty. Believe me – the peach ale makes all the difference. If only banana bread could turn out this moist:) I will make some soon with sweet Doppelbock and let you know. Check out this Roasted Garlic and Olives Studded Beer Bread in case you need a quick savory loaf. Moist, fragrant and delicious peach ale breakfast loaf made even better by the generous addition of homemade honey butter. Best eaten while still warm. Cuisine: Cooking with beer. Best beer bread ever! 1 stick unsalted butter at room temperature. Line a standard bread loaf pan with parchment paper, lightly brush it with cooking oil. Preheat oven to 350°F. In a large mixing bowl combine the flour, baking powder, salt, brown sugar and cinnamon. Mix well. In a small bowl beat the eggs and add just over 1 cup of the peach ale while continuing to stir. Note: if your peaches were smaller or firmer, add all of the ale. Add the peach ale egg mixture to the dry ingredients and whisk until well incorporated. Add the olive oil and continue whisking until homogeneous. (It is better to whisk by hand to avoid over mixing the batter). Gently fold in the diced peaches into the batter and transfer to the lined, greased bread loaf pan. In the meantime make the honey butter. Combine the butter and honey and whisk until homogeneous. Take the loaf out of the oven and let cool down for about 5 minutes. 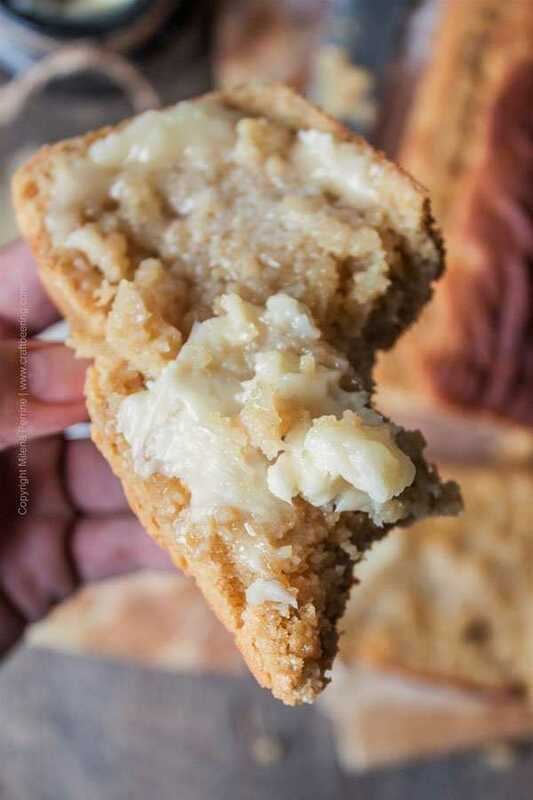 Take it out of the pan by holding the edges of the parchment paper and allow it to cool down for another 10 minutes before you gently peel away the paper and slice. Apply honey butter generously and be sure to have an enormous cup of coffee at the ready. Thanks for sharing at last weeks Friday Frenzy Link Party! 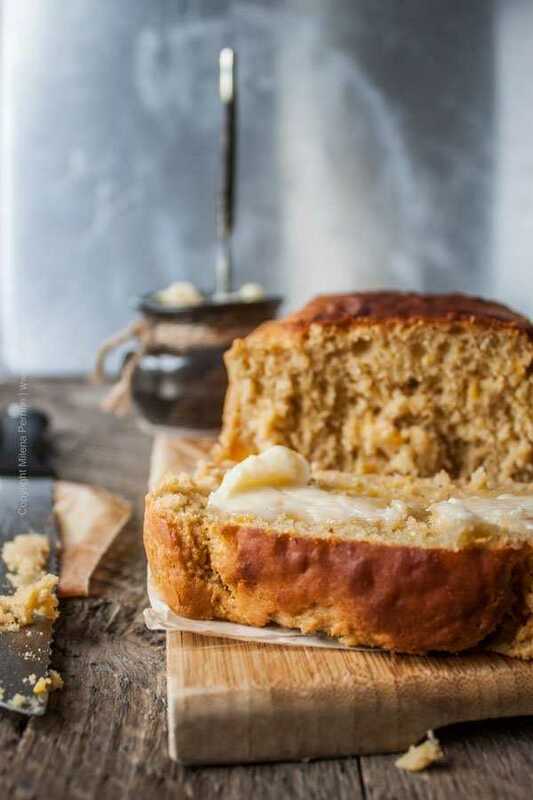 Okay, can I just come over and try everything please – Peach bread I need in my life !! I’m going to assume the Colorado peach was a different variety and cooks differently. My grandmother had an apple tree that produced apples that cooked to mush. Like bake them in a pie and they all baked together and created like apple sauce. Just varietal differences. Must be Laura.. I’ve recently discovered just how many peach varieties there were in Colorado alone!! Pretty crazy. My guess is that some varieties must have higher fiber content that doesn’t break down as easily. Still on my list of things to research thoroughly. Certainly Miz Helen! We know what it is like in the aftermath of a hurricane from living in Florida years ago. Keeping you and everyone in TX in our thoughts! Wow! Drooling! 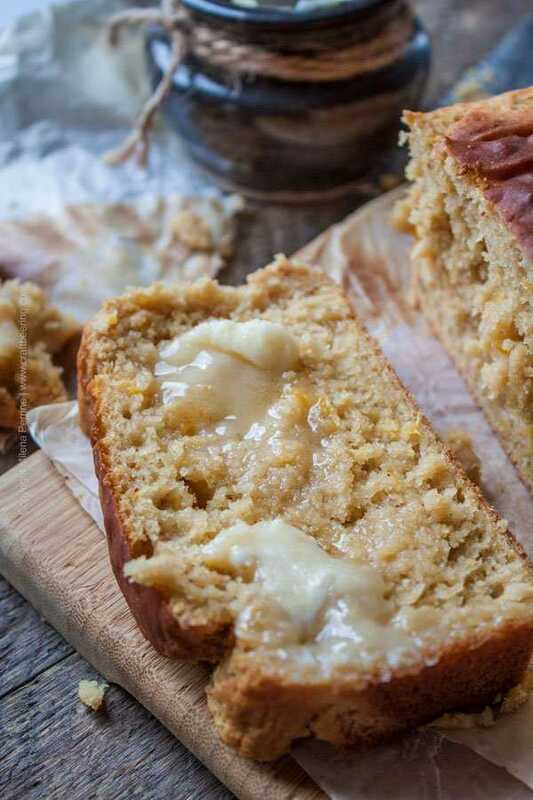 Just drooling over here…your peach ale bread looks and sounds divine…I want some!! Oh my this loaf looks good. I rarely if ever bake with peaches and I need to try it. Your photography is really well done. I find myself studying your photos for examples of how food photos should look. The lighting is bang on. Gorgeous post as always. So stoked! Thank you very much Carol! This looks delicious!! 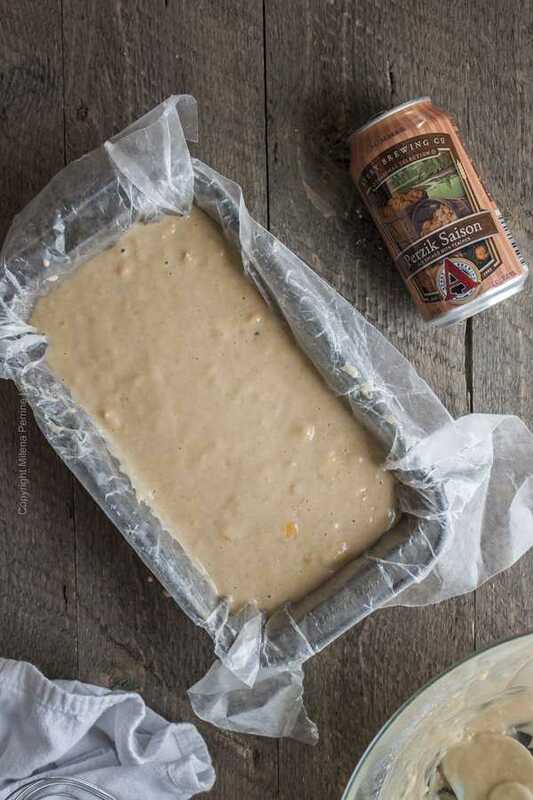 I’m convinced this is the next thing I’m going to bake, the only thing is, I swear I’ve never seen peach ale where I live! What can I use instead? Hi Becky! I am sorry to hear, hope you come across peach ale at some point, most we’ve tried are delicious. Use a Kolsch style ale instead, they are typically sweeter with bready notes or a Helles lager (sweeter Pilsner). Something without bitterness (low or no IBU) and that you find pleasant to drink on its own. Any beer will act as a leavening agent in this recipe, it is a matter of pinning down a taste that will work with fresh peaches. Perhaps you’ll find a saison that even though not a peach saison is has the typical herbal, floral aromas and flavor. I never would have been able to think this recipe up. So original and looks delicious. And what isn’t with honey butter! Thank you so much for your kind words Cathy! Now, if I can keep my kids from eating all the peaches in the house, then we’ll definitely have to give this a try. I bet it will be a hit with everyone! Thanks so much for sharing at the #happynowlinkup! Oh, my! Peaches and honey butter … be still my heart!!!!!!!!!!!!!!! Yes, peaches are different. I think a lot of it is the “ripe” date in different areas of the country. Texas peaches are long gone from the local farmers market. I usually don’t even try grocery store peaches … usually no taste. But — for this recipe … think I’ll go to Whole Foods and see if they have peaches!!!!!!!! Happy Thursday. We have that in common Nicoletta – totally love using olive oil in baking recipes. Thank you! It tastes pretty amazing too:) Thank you so much Molly for stopping by. So you made this twice and didn’t send me any??? What? Maybe next time 😉 Honey butter is soooo good and I love that little pot that you have yours in. Too cute. I’m starting to get quite the little collection of dishes now, lol. If I saw that one, I’d totally grab it! Pinning this beauty. P.S. great video as usual! This loaf really doesn’t travel well, lol. The little pot I scored at the local thrift store. Wasn’t sure what to use if for at first:) Thank you so much! Swoon! This sounds too good for words. There’s no way this would feed four around here; I’d have to make at least two loaves because the first one would be all for me! With extra generous amounts of honey butter :). Have a fantastic day, Milena! I wish I was sitting down to a slice (or 5 🙂 of this one! I’m going to scour the beer store for a peach ale this week, so I can have a go at it while it’s lovely peach season 🙂 Beautiful! They will have peach ale, I am sure:) Thank you Jennifer! Goodness! I’d love a big piece or three…with a gorgeous slathering of that sweet honey butter! Wish we were neighbors!! Pinned! I would not mind one bit being neighbors with you Annie! I’m drooling, this looks so good! It is indeed drool worthy:) I was shoving pieces in my mouth while still taking the video, lol. Spared you guys that footage.